The arachnoid membrane is the middle of the three delicate membranes, called meninges, covering the spinal cord and brain. 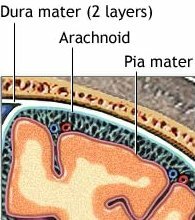 The arachnoid membrane lies between the pia mater and the dura mater. The arachnoid and the choroid plexus act together at the barriers between the blood and cerebrospinal fluid (CSF) (see blood-brain barrier). On the external surface of the brain the ependymal cells fold over onto themselves to form the double-layered structure, lying between the dura and pia, which is the arachnoid. Within the double layer is the subarachnoid space, which participates in CSF drainage. Passage of substances from the blood through the arachnoid membrane is prevented by tight junctions. The arachnoid membrane is generally impermeable to hydrophilic ('water-loving') substances, and its role in forming the blood-CSF barrier is largely passive.